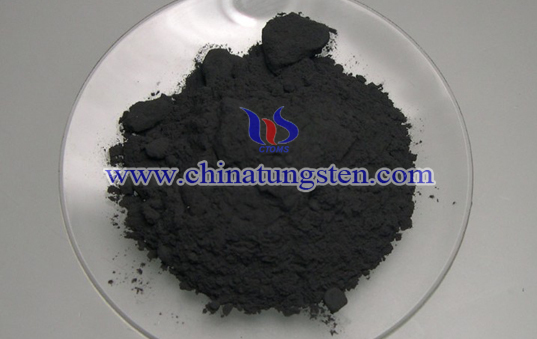 Tungsten powder is used as the raw material of tungsten, tungsten alloy and tungsten carbide products. Tungsten oxide is the raw material of tungsten powder. 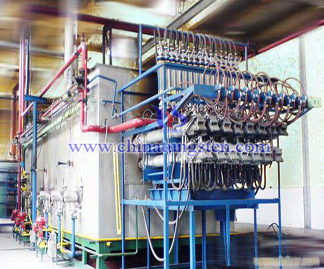 By hydrogen reduction in four tube muffle or multi tube muffle, its grain size varies from 0.6~30um. It is divided into coarse, middle and fine grain size, the impurities content is subjected to national standard. By hydrogen reduction, using tungsten oxide or APT as raw material. The producing process is usually consisted of two steps: The first one is reducing tungsten trioxide into tungsten dioxide under 500~700℃. The second one is reducing tungsten dioxide under 700~900℃. The reduction is processed in electric tube furnace or rotary furnace. Property of tungsten powder like purity, grain size are determined by reduction method. In electric tube furnace, influencing factors of reduction speed are temperature, loading capacity of tungsten trioxide in sintering boat, moving speed of sintering boat, flowing rate and moisture content of hydrogen. With the rising temperature, its grain size is getting coarse. 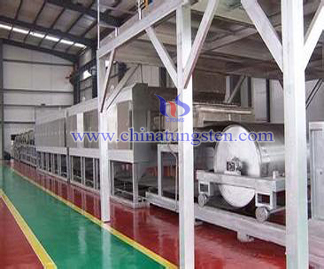 Apart from hydrogen reduction method, tungsten oxide of carbon reduction method was used in the early days. Aluminum, calcium and zinc to reduce tungsten oxide is also under study. If finer grade is required, tungsten chloride hydrogen reduction can obtain thegrain size smaller than 0.05um. Apart from impurities content, oxygen content should be also controlled within a certain limit. Common used grain size is 2~10um. Its apparent density, tap density and specific surface area are also changes within a certain range. Property of tungsten powder has direct effect on quality of tungsten product, especially its purity and grain size. The crucial physical properties are average particle size, particle size distribution, apparent, tap and compact or green density, specific surface area, degree of agglomeration and morphology. They are to a certain extent related to each other and can be influenced between limits by the oxide properties and the reduction conditions. Tungsten powder is widely used in the production of weight fillers, radiation shielding fillers and induction accelerators, etc.. The thin film surface of its polymer mixture is ideally suitable for radiation protection. The large particle size makes it an ideal heavy metal filler for injection-molding applications. The unique shape and the resulted high flow ability of the particles make it suitable for applications in metal spray industry. The whole palette of particle sizes finds applications in cemented carbide production. The main portion of tungsten powder is directed to that manufacture. Starting tungsten powder for ductile tungsten and powder metallurgically produced tungsten alloys covers particle sizes between 2 and 6µm. Extremely coarse powder gained by screening to separate any finer particles has excellent flow characteristics and is used in plasma spraying. In summary, tungsten powder is the main material of tungsten product and tungsten alloy by powder metallurgy. It can be made into wire, rod, tube, plate and other tungsten products of different shapes. It can be mixed with other metal powders and then made into tungsten-molybdenum alloy, tungsten-rhenium alloy, tungsten-copper alloy and high density tungsten alloy. Tungsten powder being made into tungsten carbide powder can then be used to produce tungsten carbide product like drill, module and milling cutter. Besides that, tungsten powder is also used in emerging industry in recent years like anti-radiation fabric, fire-proof clothing and anti-fouling coatings. Chinatungsten Online can customize our powders to specific applications. Customer specifications can be developed after technical discussions at time of inquiry. Each shipment of powder is accompanied by a standard certificate of analysis, which includes F.S.S.S average particle size, apparent density, purity and impurities content. Regular packing considered of protecting environment is with double inner aluminum foil of 50kgs, 100kgs or 200kgs net each, in iron drums. Other customized packing is also accepted.